Washington, Georgia claims to be the first city officially named after General George Washington. The year was 1780, prior to George being elected president. More surprising, he never slept there. I did, however, in a fabulous boutique hotel: The Fitzpatrick. Originally constructed in 1898 by brothers John and Thomas Fitzpatrick, the hotel operated until 1952. It was listed on the National Register of Historic Places in 1982. 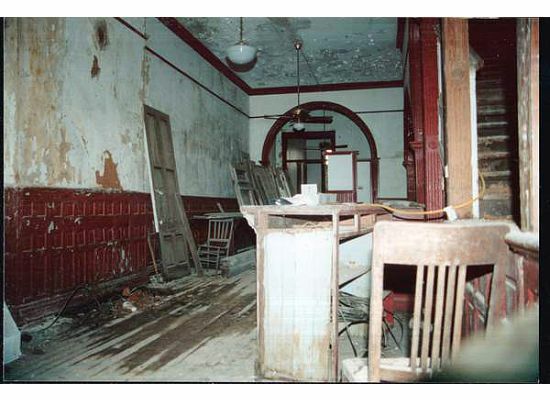 Sadly, the old hotel stood neglected for fifty years until Christy and Mike Todd purchased the building in March 2002. 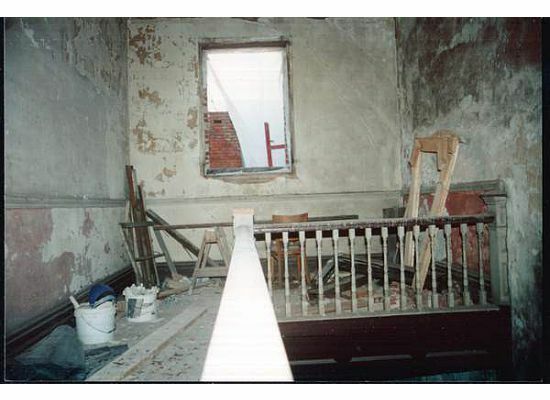 They began an intensive and costly restoration that culminated in its grand re-opening on June 12, 2004. Today, the Fitzpatrick looks almost exactly as it did during its first opening in 1899. 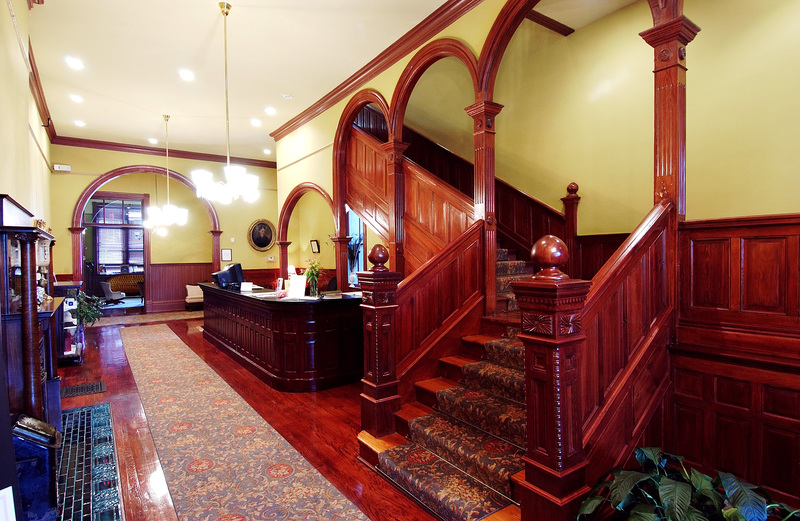 Every detail, from the intricate woodwork and paneling to the wall colors, was restored to original. Entering the ground floor lobby feels like stepping back in time to gracious hospitality and genteel manners. The warmth of the wood and curving grand staircase are truly inviting. I was greeted by Amit Nehta, Christy’s father, who was working the front desk. He proudly showed me the fascinating photo album of before and after renovation shots. What a mess it was! Amit told his daughter to forget the plan, but she and Mike were determined. The couple went beyond expectations to bring this gem back to Washington. Photo @by Gary Meek Three beautiful windows wrap around the space large enough for a small table and two chairs. The room also includes a tiled gas fireplace for added ambiance. I stayed in the Tower Room which, as you might guess, includes a section of the round tower. Three beautiful windows wrap around the space, large enough for a small table and two chairs. The room also includes a tiled gas fireplace for added ambiance. The hotel can be booked for groups or social events that need a conference room, ballroom, full catering kitchen, or an outdoor event in the courtyard. Continental breakfast is served each morning. 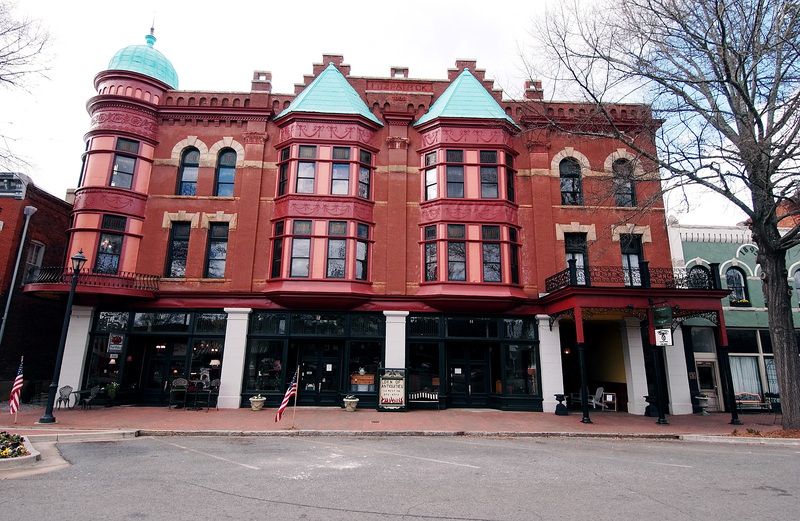 The Fitzpatrick Hotel is located on Courthouse Square in the center of the 7.9 square mile city, commonly called Washington-Wilkes, to avoid confusion with the nation’s capitol. 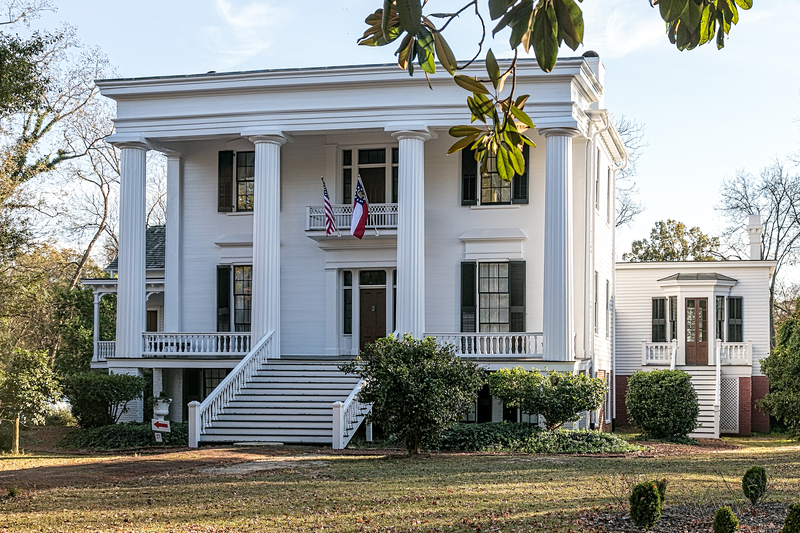 Despite being small, population around 4,000, Washington-Wilkes claims to have more antebellum homes per capita than any other city of its size in Georgia. There are over a hundred houses with white columns, magnificent porticos and wrap-around porches. They say, in Washington, you experience a sense of place and a sense of grace. I agree, I was touched by true southern hospitality. During the War Between the States, Washington-Wilkes played host to the last full cabinet meeting of the Confederacy, which took place in the old Bank of Georgia building–also known as the Heard House. It was here that Jefferson Davis and cabinet members officially dissolved the government of the Confederate States of America. It was also the last place that the infamous Confederate gold was tracked… and never found. • First successful cotton gin was perfected and set up by Eli Whitney in Wilkes county, 1795. • First woman newspaper editor in U.S. was Sarah Porter Hillhouse, who became editor of the Monitor in 1804. • First stamp mill for gold in the world was invented and put into use near Washington by Jeremiah Griffin, 1831-1832. • One of the first plastic garments ever cut in the world was in Wilkes County by Margo and Alfred Moses in February 1946. • Washington was the home of Baptist minister Reverend Jesse Mercer, who wrote many world famous books about the Christian faith, and was the founder of Mercer University in Macon, GA.
• Home of the first free public library in the state of Georgia. The Mary Willis Library was built in 1888. The area also played a major role in early United States history. The Revolutionary battle of Kettle Creek was fought in Wilkes County on February 14, 1779. This battle was responsible for driving the British out of northeast Georgia. Callaway Plantation is a historic restoration project of the City of Washington. History is brought to life for those who visit the three restored homes, structures, farm and fields. Start at the 1785 hewn log cabin, which is authentic, but had to be moved to the property. Here, a family with seven children lived for six years. 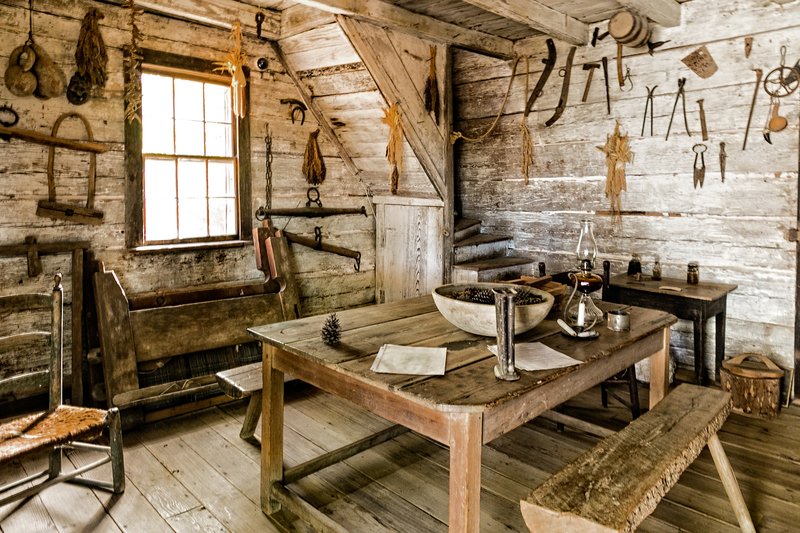 Interior of the Log Cabin at Callaway Plantation @Bylandersea. The plantation includes the great manor house in Greek Revival style, which remains virtually unaltered from when it was built in 1869. The brick mansion was built by the Callaway family out of Georgia red clay. It contains no indoor plumbing or electricity, since it was never modernized. Connected to the rear of the mansion by a breezeway is a self-contained brick kitchen with numerous interesting artifacts. You can also visit a smokehouse, pigeon house, barn and cemetery and pick cotton in the small plot behind the main house. Don’t miss the 1871 one-room schoolhouse, an 1840 slave cabin, and a 1930 general store. 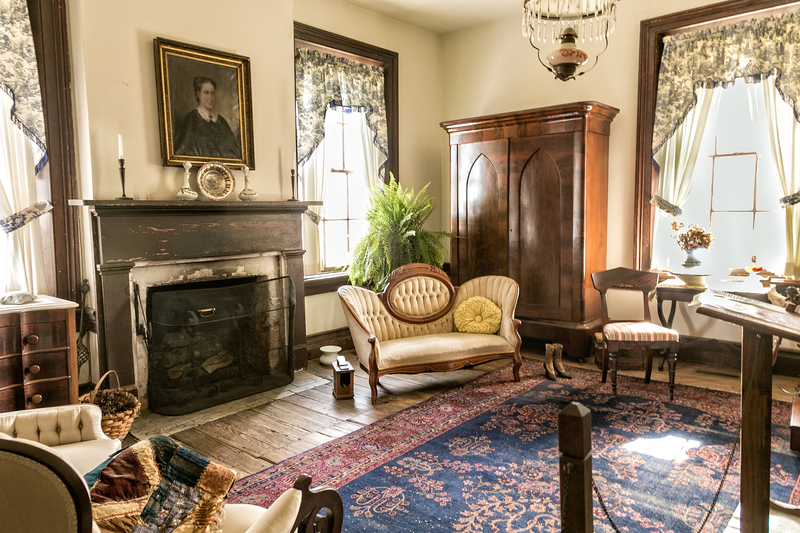 Callaway Plantation is a rare gem, because it has been in control of the same family since the arrival of settlers in the 18th century. Much of the family furniture and equipment has been saved and is on display. An annual event every October is Mule Day. Visit then to really see the plantation come to life. The Washington Historical Museum boasts a large collection of Civil War relics, Indian artifacts, and a recreation of 19th century home life. The Civil War relics include Jefferson Davis’ camp chest and General Robert Toombs’ uniforms. The museum also houses a fine collection of guns of the period. The grounds have also been landscaped, using an early garden plan and plants typical of ante-bellum gardens. Here, I learned the fascinating story of Mammy Kate, who was a very large house slave owned by future Georgia Governor Stephen Heard. According to Peggy Galis, a descendant of Heard, “The story is that Mammy Kate, upon learning Heard was captured, traveled to the prison camp in Augusta, where she volunteered to wash clothes for the British officers, a deed that gave her access to the prison and eventually to Heard. Given privileges not only to wash clothes, but to bring in food, she entered the compound with a clothes basket, secured Heard — who was a physically small man — in the basket and carried him outside the prison. “Heard, who was grateful for the woman’s ingenuity and bravery, gave Mammy Kate her freedom, along with some land, but she insisted on staying at the Heardmont plantation,” Mammy Kate was the first black woman honored by the Georgia Daughters of the American Revolution. 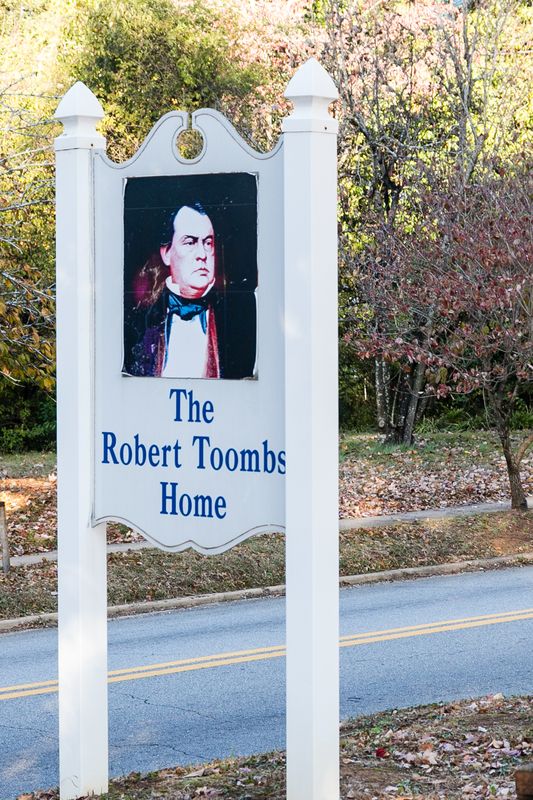 Robert Toombs was born and raised in Washington and was one of its most influential citizens. Toombs was a successful planter and lawyer, as well as an elected U.S. Congressman and Senator. Thus, Toombs worked in two cities named Washington. Toombs also served as Secretary of State for the Confederacy for a period, became a Brigadier General under Robert E. Lee, and had ambitions to become president of the Confederacy. He lived abroad in exile for several years after the war. Upon returning to America, Toombs scorned the thought of accepting political pardon. In 1880, he boasted, “I am not loyal to the existing government of the United States.” He spent the rest of his days in his hometown Washington, and always had his door open to friends and visitors. The Robert Toombs Home is now open to tourists and it is worth a look, especially if you are into architecture. I loved his library/office which is stacked with his old collection. I only had time to drive by the Mary Willis Library; the first free library in the state of Georgia. Architect Edmund Lind of Atlanta designed the building in warm high-Victorian style. 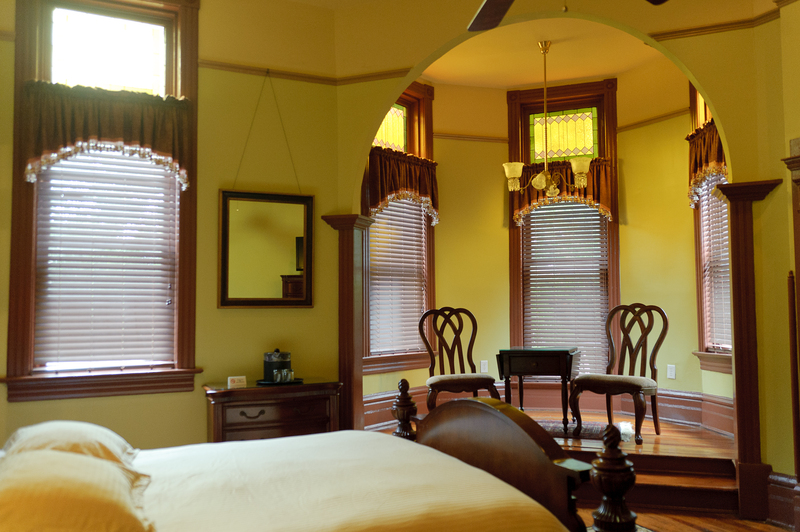 Tall stained-glass windows light its high beamed interior, where original furnishings are still in use. The central window, commemorating Mary Willis, was made at the Tiffany factory in New Haven. A valued relic of the library is one of three chests brought to Washington by the Confederate Treasury in May 1865, containing coins to pay off the soldiers who were following the government in its retreat from Richmond. 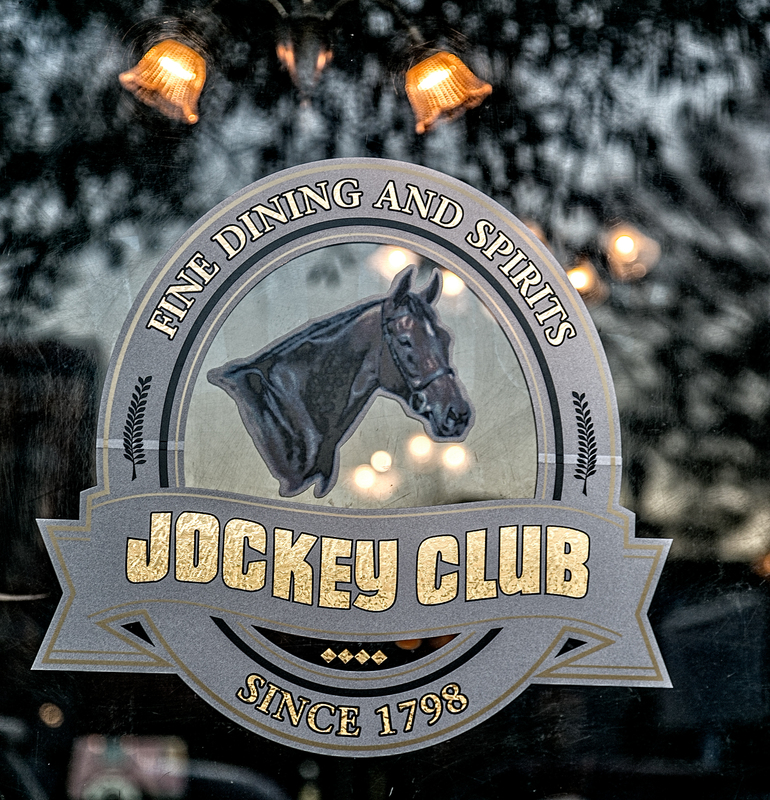 Horses are the theme of the Washington Jockey Club (the area surrounding Washington is horse country), and the restaurant offers fine dining in a historic setting on the main square. Its delicious pecan-crusted chicken seems to be a local favorite along with shrimp and grits. Laura Connely is the epitome of an artist, a free spirit with a laid back attitude. I took an acrylic class with her, and while my painting is nothing to be proud of, she was an inspirational teacher and I had a lot of fun. I simply need a lot more lessons and much more time with a brush in my hand. This is an ideal activity for a girls’ getaway weekend. Washington- Wilkes is located two hours from Atlanta, 45 minutes from Athens and an hour from Augusta.